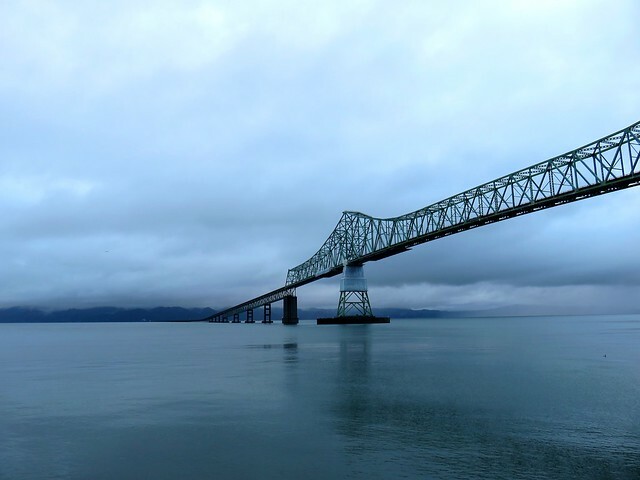 Little did we know, snug in our honeymoon suite at the Cannery Pier Hotel in Astoria, that four miles away, across the mouth of the mighty Columbia, lurked Dismal Nitch. That little cove on the Washington State side of river was so named by Captain William Clark when the Corps of Discovery was forced off the river on November 10, 1805 and spent six stormy days pinned to what Clark described as “that dismal little nitch.” Fierce wind and high waves at the rocky shoreline had Clark concerned for their safety: “A feeling person would be distressed by our situation,” he wrote in wet misery as they endured the cold wind, rain, thunder, lightning, and hail. Finally the storm broke and the Corps pressed on to reach the Pacific Ocean. They moved to Station Camp on the west side of Point Ellice just beyond Dismal Nitch, and camped at that location for 10 days, taking the famous vote by which they decided to move to the south shore of the Columbia River and spend the winter there before beginning their long journey home. Wendy and I had stayed three nights on the Columbia’s south shore. On our last morning in Astoria, I watched ships passing by our room before we drove downtown for breakfast at the Blue Scorcher Bakery & Cafe. Wendy called that worker-owned cooperative a “hipster bakery” and was unimpressed by their locally farmed, certified organic berries, which were too sour for her French toast. They crafted their own soda, too, which we’d encountered before in Austin, TX. You had to clean up your own mess, but at least their single-user restrooms were large and gender-neutral, which was nice. We drove the 4.1 miles across the Astoria-Megler Bridge so we could cross into Washington State for a scenic forest drive towards Mount St. Helens. 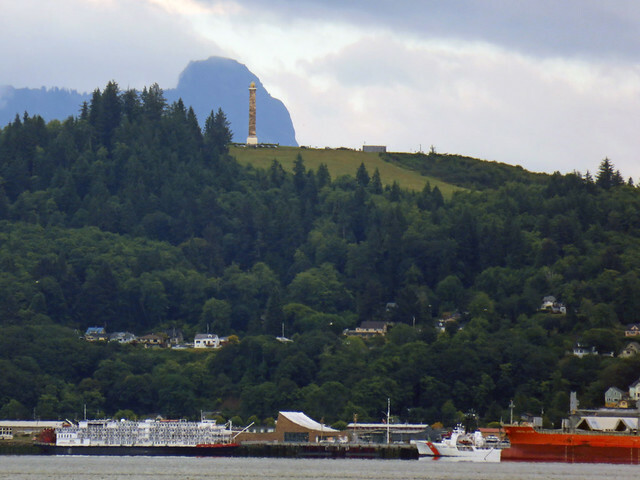 We stopped at Dismal Nitch, where we could see Astoria across the river, including the Astoria Column via the superzoom camera. 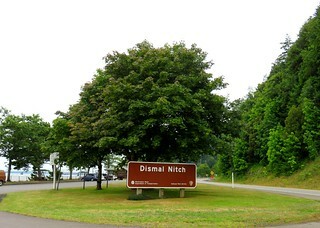 I was amused by a sign asking us to limit our stay at Dismal Nitch to eight hours, as with that name we weren’t tempted to stay longer than eight minutes despite the view and the pretty gulls. Wendy must have thought I was quite the romantic, taking her to Dismal Nitch, which lies just east of Cape Disappointment and what Clark termed Point Distress. The highway could not follow the rocky north shore of the Columbia, so it wound its way eastward along river valleys through the mountains. We made a short side trip to the Grays River Covered Bridge, the last of its kind still in use in Washington State. After the highway ducked back south to return to a friendlier portion of the river shore, we stopped and shopped at a pharmacy in little Cathlamet before heading eastward to Longview. There we stopped in at a Fred Meyers and had lunch at the Guadalajara Grill and Cantina. I had been missing Mexican food, but Wendy claims Mexican food isn’t particularly good north of Texas and New Mexico, with some occasional exceptions like Enrique’s at Ponca City. The Mount St. Helens stratovolcano erupted in 1980. 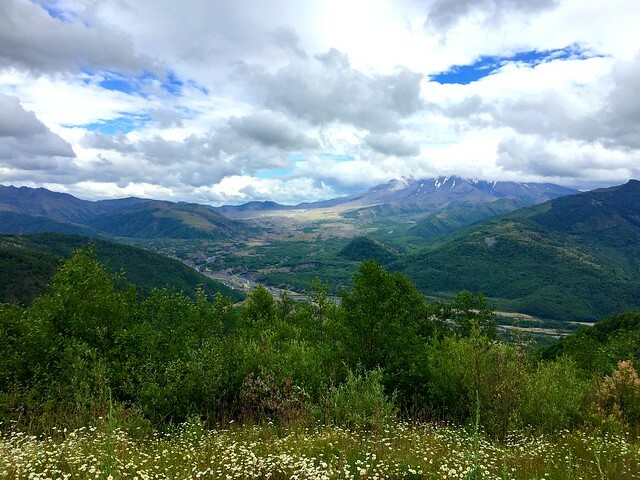 Eighteen years later I visited the mountain with fellow science teacher Wendy Robinson and her mother and uncle. I recalled being impressed by the quality of the displays at the Visitor Center, built in 1993 in a state park 30 miles from the mountain. Well, that center has not been updated, so its displays 18 years later looked faded and worn. But I still enjoyed the big topographic model of the volcano area and a display of items melted in the eruption. Wendy bought a jacket, something she’d need on the cold and windy heights of Johnston Ridge near the crater. My strongest impression of visiting Mt. 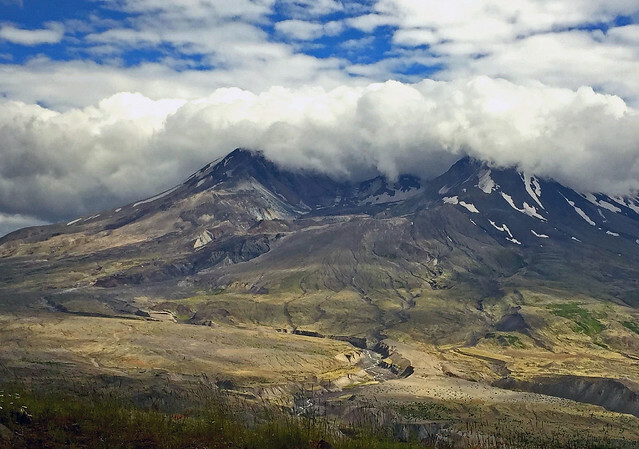 St. Helens 18 years after its latest big eruption was how quickly nature was reclaiming the ravaged landscape. Now the time of recovery had doubled to 36 years. It made me feel old to know it had been so long since the eruption, yet I was buoyed to be revisiting the mountain on my honeymoon and find nature busily renewing the landscape, much as my new bride had renewed the prospect of my life. At the same time a mushroom-shaped column of ash rose thousands of feet skyward and drifted downwind, turning day into night as dark, gray ash fell over eastern Washington and beyond. Wet, cement-like slurries of rock and mud scoured all sides of the volcano. Searing flows of pumice poured from the crater. The eruption lasted nine hours, but Mount St. Helens and the surrounding landscape were dramatically changed within moments. Wendy and I drove along the Spirit Lake Highway toward the volcano, making a pit stop at the Forest Learning Center and stopping at the Elk Rock viewpoint, ten miles northwest of the crater. 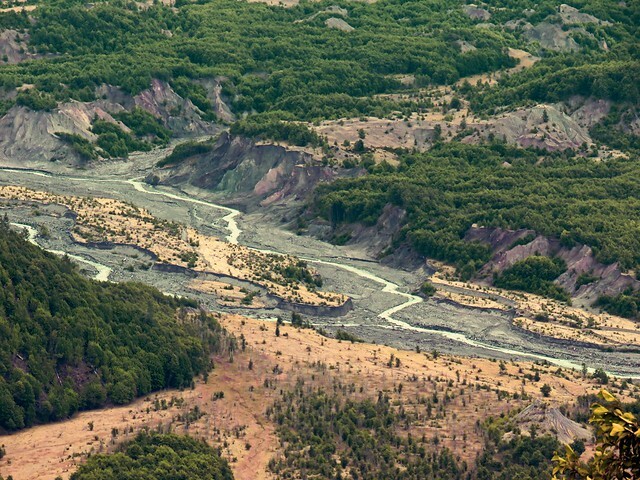 From there we could see how the Toutle River Valley had changed since my previous visit, with greenery amidst the immense ash flow. It grew colder as we ascended for more spectacular views, and we were surprised by the cold and relentless ferocity of the wind near the end of the highway on Johnston Ridge at Loowit Viewpoint. 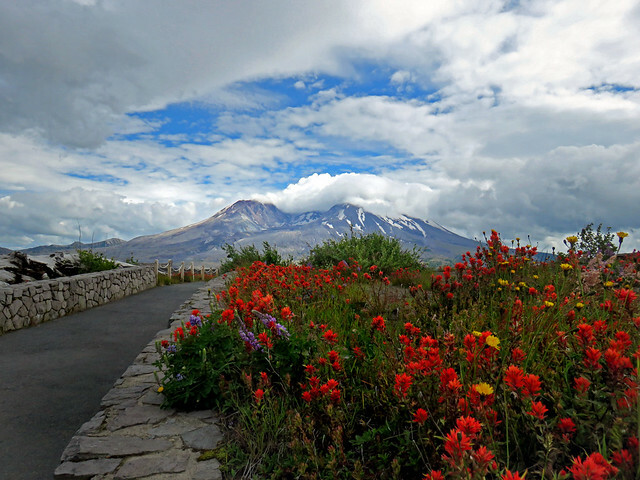 Beautiful flowers contrasted with the brutality of the volcano, its crater shrouded in clouds. After a pit stop at the Johnston Ridge Observatory we needed to head to Packwood for our overnight stay. It was only 40 miles northeast of the volcano, but in that isolated mountainous terrain that meant a two-hour 120 mile drive. Along the way we stopped at the Lake Mayfield Resort & Marina for dinner. The Crest Trail Lodge near Packwood was uninspiring after our stay at the Cannery Pier Hotel & Spa, but we were glad to rest after a long driving day. My hopes that we would get to visit Mt. Rainier the following day were dashed by rain, but we saved the day by visiting Tacoma’s Museum of Glass.